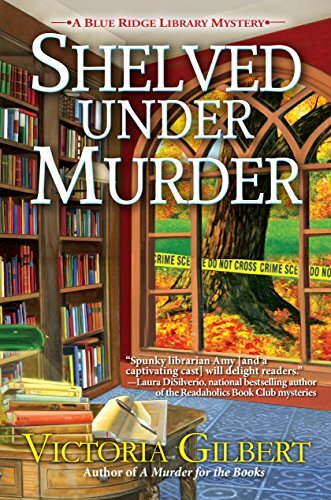 Amy and Richard stumble upon another body in the second novel in the Blue Ridge Library series, Shelved Under Murder. Amy is the head librarian and Sunny is her assistant at the perpetually underfunded Blue Ridge library. Sunny convinces a local artist to donate three paintings to the library. While retrieving them, Amy and Richard find the artist, Rachel LeBlanc, stabbed to death in her artist’s studio. In the same studio are several art forgeries hidden in a secret closet. The romantic relationships shine more than the mysteries in Shelved Under Murder. My biggest complaint is that there are no gray areas in the characters. They are either devils or saints. In addition, no one has much of a reason to be a villain other than for the love of money. With such shallow motives, this book receives 3 stars. Be aware that Shelved Under Murder describes the conclusion of the first book, including the murderer’s name, multiple times so plan to read them in order.